Cyclists worldwide will be taking it all off as they ride to protest the world's dependence on oil and other forms of non-renewable energy. There's naked, bad naked and then there's naked protests on a bike. Parents with small children will want to steer clear of Central Park on June 20 when hordes of naked cyclists plan on taking a Saturday ride. 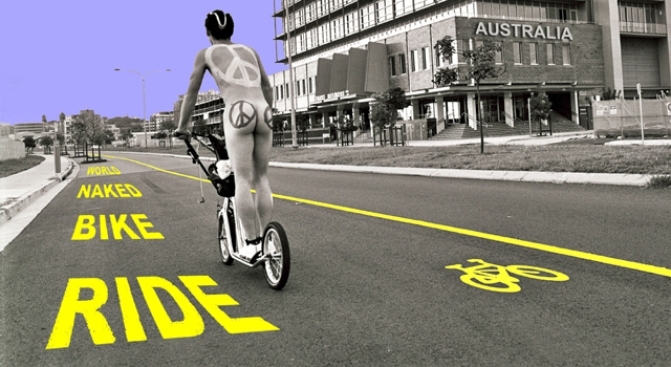 The event is part of World Naked Bike Ride, which began in Australia last week. The group rides in the buff to "protest oil dependency an celebrate the power and individuality of our bodies," according to their website.